"Id, ego and super-ego are the three parts of the psychic apparatus defined in Sigmund Freud's structural model of the psyche; they are the three theoretical constructs in terms of whose activity and interaction mental life is described. 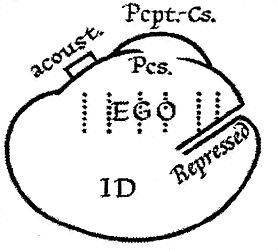 According to this model of the psyche, the id is the set of uncoordinated instinctual trends; the super-ego plays the critical and moralizing role; and the ego is the organized, realistic part that mediates between the desires of the id and the super-ego. The super-ego can stop you from doing certain things that your id may want you to do. Although the model is structural and makes reference to an apparatus, the id, ego and super-ego are purely symbolic concepts about the mind and do not correspond to actual somatic structures of the brain (such as the kind dealt with by neuroscience). The concepts themselves arose at a late stage in the development of Freud's thought: the "structural model" (which succeeded his "economic model" and "topographical model") was first discussed in his 1920 essay Beyond the Pleasure Principle and was formalized and elaborated upon three years later in his The Ego and the Id. Freud's proposal was influenced by the ambiguity of the term "unconscious" and its many conflicting uses." I think Freudian psychology is concepts that only have subjective or shared-subjective quality. Like the models only work when you use them to understand people subjectively or with a communication-partner, not when people are to be observed at an objective level. Browse all forum threads for category CEST, subcategory General and thread Cognitive-Experiential Self-Theory of Personality (PDF) here. Browse all forum threads for category Five Factor Model, subcategory General and thread Neuroticism here. Browse all forum threads for category Miscellaneous, subcategory General and thread The Life of A Thought in the Brain here.